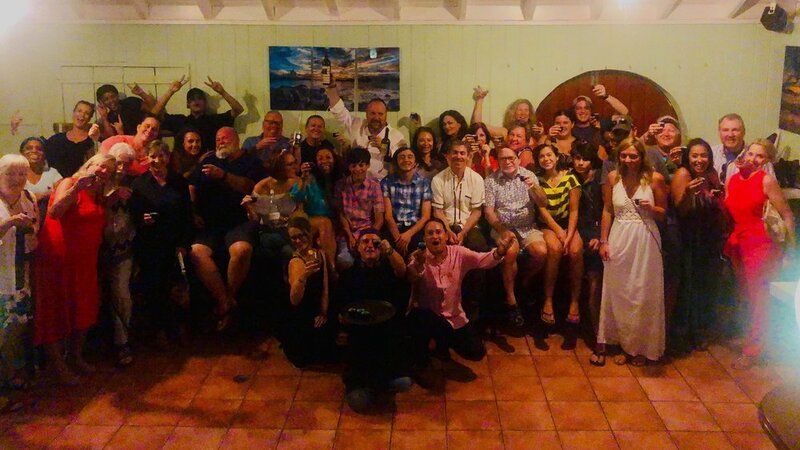 In March Chef Fabio Zaniboni took over the kitchen at Lucky Chops to bring a taste of his home country to St. John for our March Full Moon Dinner. Hailing from northern Italy, Chef Fabio designed a menu themed Italian Five Seasons for the Full Moon Dinner that showcased authentic tastes and techniques from Italy. The wines and liqueurs paired with Chef Fabio’s Full Moon Dinner were also from Italy giving our sold out dining room an immersive taste of the Bel Paese (the Beautiful Country). The Italian Five Seasons menu began in springtime with the first course themed Spring Break. Chef Fabio served a rainbow trout apple cider marinated Carpaccio with baby arugula and mandarin vinaigrette. Chef Fabio’s twist on this traditional dish from Venice was light and tangy and so perfectly suited to be paired with a glass of 2018 Bertani Due Uve with its unique, crisp blend of Pinot Grigio and Sauvignon Blanc grapes. Then from springtime into summertime, the second course of the Italian Five Seasons menu featured Prosecco cantaloupe sorbet with dried Parma ham leaves, fig marmalade, baked eggplant, and ricotta cheese foam. The dish was paired with the 2016 Belguardo Vermentino, a wine made from grapes harvested along the Tyrrhenian sea coast known for it sapid fruity taste which complimented the lighter, sweeter notes of the dish. The theme for the third course was Foggy Autumn, and to represent the season Chef Fabio served hand pinched Agnolotti del Plin in parmigiano and Asiago cheese fondue with truffle drops and toasted walnut dust. This style of pasta is typical of the Piedmont region of Italy, near the French and Swiss border. To pair with the earthy flavors of the third course diners enjoyed a glass of 2012 Fontanafredda Serralunga, a dry but full bodied Barolo also from the Piedmont region of northern Italy. The Winter Heat course, which followed Foggy Autumn, featured veal Ossobucco and spinach spaetzle with corn cakes. The classic Italian dish delivered the rich robust flavors it’s known for and was paired with an equally full bodied 2012 Ruffino Reserva Dule Oro. 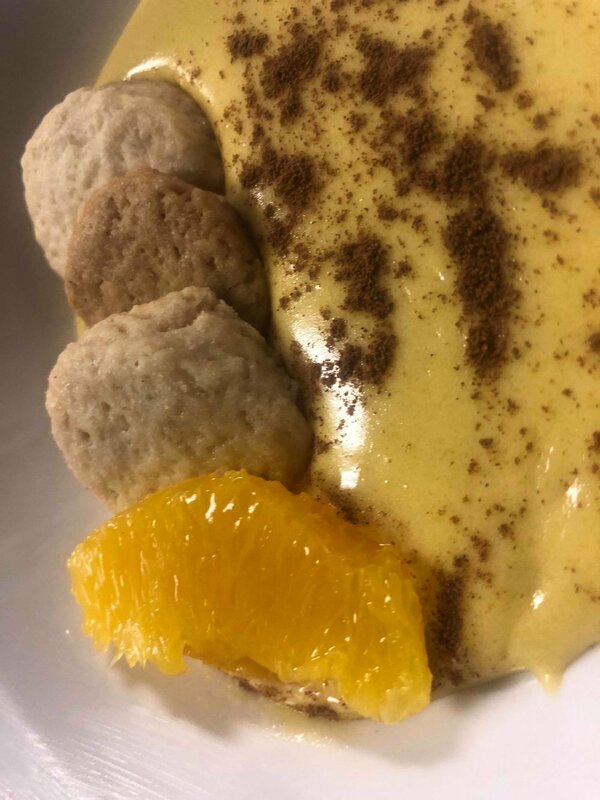 The fifth and final course of the Italian Five Seasons Full Moon Dinner was a dessert inspired by cuisine from the southern regions of Italy, Zabaglione Marsala and Sicilian almond cookies. To pair with the dessert course Lucky Chops bartenders created “The Godfather” a Disaronno based cocktail whose almond undertones complimented the nuttiness of the dessert. Thank you to all our our guests who attended this sold out Full Moon Dinner, and a special thanks to chef Fabio and his staff who created with such love and attention this amazing Italian feast. The next Full Moon Dinner at Lucky Chops is Saturday, April 20th (starting at 6pm). The April dinner is themed Japanese Extravaganza with an 8 course menu designed by Lucky Chops’ Sushi Chef Larry Parnell (see full menu below). The meal will take diners on a culinary tour of the Japanese isles, and is available with sake pairings. Like the March Full Moon Dinner this is a one night only event with limited seating and is sure to sell out so reserve your seats today by calling the Lucky Chops’ office at 340-690-3868 or sending an email to Office@StJohnCatering.com with your contact information so we can obtain a credit card to secure your spot (cancelation fees apply).